groups. But as the chart on the right shows, among the young it’s actually gone down. Why? 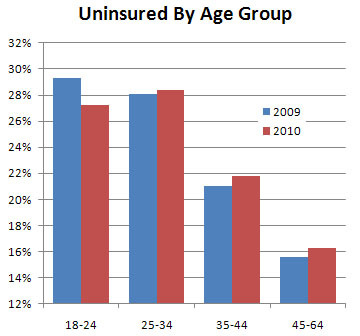 Why aren’t 18- to 24-year-olds suffering the same fate? What makes them so special?….The circumstantial evidence suggests, very strongly, that the Affordable Care Act is the primary factor. Remember, one of the first provisions to take effect was a requirement that insurers allow young adults, up to age 26, to stay on their parents’ policies if employer-sponsored insurance is not available. Even though that requirement didn’t kick in until the fall, several insurers began offering such coverage earlier, in anticipation of the new rule….These numbers are striking — and seem to suggest that the Affordable Care Act is already helping large numbers of people. This is what every single Republican presidential candidate and the entire Republican leadership wants to take away. Your mileage may vary, but it’s not a vision of America most of us should welcome.